CON programs, which originated in New York in 1964, were developed as an attempt to (1) control healthcare costs, (2) increase charity care, and (3) ensure the provision of rural care. State CON laws were a conditional requirement for receiving federal funding from 1974 until the repeal of the National Health Planning and Resources Development Act in 1986. 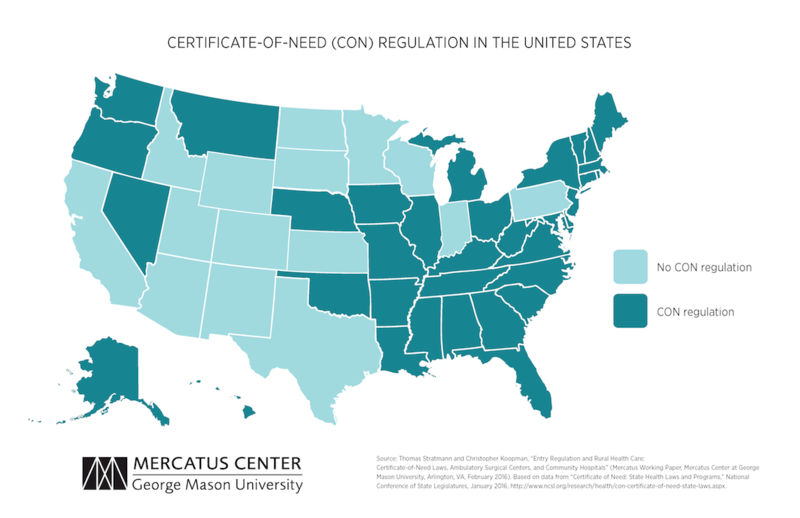 Twelve states repealed their CON programs in the late ’80s, three states repealed them in the ’90s, and one state has repealed its CON program since 2000. Currently, 36 states and the District of Columbia operate some form of a CON program. 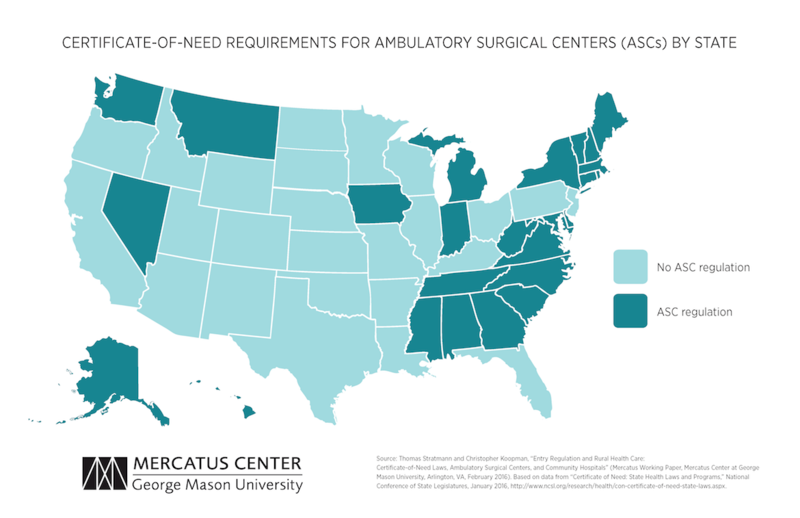 Few prior studies have focused on whether CON laws affect the provision of rural health care, and the hypothesis that cream-skimming by ASCs will decrease access to care. The cream-skimming hypothesis suggests that ASCs will threaten the financial stability of hospitals by taking away their ability to subsidize the costs of complicated patients by revenue from less-complicated patients. Because rural areas may have only one or two hospitals, a hospital closure in a rural area could negatively impact access to care. This study tests two related hypotheses to determine the impact of ASC regulation on the provision of health care in states with and without CON programs. The study uses two state-level annual measures of healthcare providers, the number of community hospitals per capita and the number of ASCs for the years 1984–2011, both obtained from the Centers for Medicare and Medicaid Services Provider of Services (POS) file. Rural areas are defined as areas outside a core-based statistical area, a designation by the Office of Management and Budget for areas with at least 10,000 people, using the zip code of each facility provided in the POS file. State-level CON program data for 1992–2011 come from the American Health Planning Association’s annual survey; for state-level laws before 1992, the study uses HeinOnline’s Digital Session Laws Library. Socioeconomic control variables, population sizes, poverty level information, and racial and age demographics come from the Census Bureau. State nominal income data come from the Bureau of Economic Analysis and are converted to real income using the consumer price index from the Bureau of Labor Statistics, with 2011 as the base year. State-level unemployment data are taken from the Bureau of Labor Statistics. Mortality rates because of lung cancer and diabetes by year and state for the population 18 years old and over are collected from the Centers for Disease Control and Prevention and are used to control for state health status. The presence of a CON program is associated with 30 percent fewer hospitals per 100,000 residents across the entire state. The presence of a CON program is also associated with 30 percent fewer rural hospitals per 100,000 rural residents. The presence of an ASC-specific CON is correlated with 14 percent fewer total ASCs per 100,000 residents. The presence of an ASC-specific CON is associated with 13 percent fewer rural ASCs per 100,000 rural residents. The data do not support the cream-skimming hypothesis as a justification for CON programs. ASC-specific CON laws serve as effective barriers to entry for ASCs, both in rural areas and throughout the state. However, as barriers to entry, CON programs do not promote access to rural care in the form of rural hospitals. CON laws are associated with a decrease, not an increase, in the number of hospitals, rural or otherwise. Policymakers seeking to protect access to rural care should not use CON programs to achieve their goals.